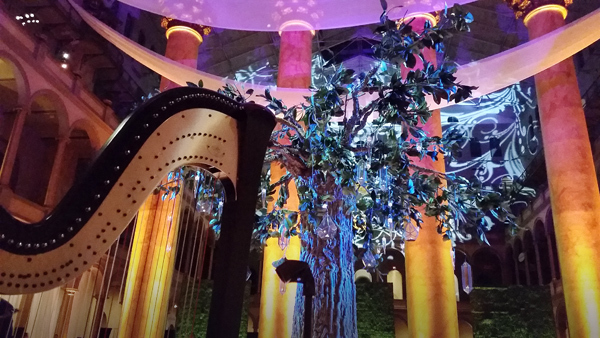 Whether it's a lavish affair or an intimate gathering, the harp provides a unique and elegant musical backdrop that adds to the ambiance of any event. Nadia regularly performs for high-profile events throughout the nation's capital, and has performed for notable guests including First Lady Michelle Obama, Meryl Streep, Martha Stewart, Michael Douglas, Stephen Colbert, Clint Eastwood, Brad Pitt, Quincy Jones, Michelle Kwan, The Civil Wars, Matthew Morrison from Glee, Gary Sinise, Bill Marriott, Chef José Andrés, former Presidents George H. W. and George W. Bush, Henry Kissinger, Hillary Clinton, Madeline Albright, French President François Hollande, and Vice President Joe Biden. Recent events include Capitol File Magazine’s 2018 Fashion Frenzy Celebration at Perry Belmont House, Ford's Theatre's Gala at the U.S. Capitol, the Shakespeare Theatre Company's Gala at the National Building Museum, the Young Presidents' Organization Gala at the Washington National Cathedral, the Horatio Alger Awards at DAR Constitution Hall, the National Association of Corporate Directors conference, the Smithsonian Campaign's Dinner at the Portrait Gallery, and receptions at the State Department, the Canadian Embassy, the Austrian Embassy, Gaylord National Resort, and the Willard Hotel. Nadia served as the harpist for Secretary of State Hilary Clinton and Secretary of State Mike Pompeo’s swearing-in ceremonies, as well as the White House Christmas Party in December 2006, and the 2013 White House Inaugural Ball where she performed with Lady Gaga and Tony Bennett. For a list of select venues where Nadia has performed, click here. Available repertoire includes a wide range of music that can be customized for your event. Selections include Classical, Baroque, Romantic, Irish/Celtic, Folk, Classic Jazz, Broadway, World Music (with an emphasis on Latin), New Age, and current Pop & Contemporary songs. Rates depend on the length of the event and musical requirements, and may include mileage fees for events outside of the Northern Virginia/D.C. area. Please contact me for a personalized quote based on your event details. In addition to solo harp, Nadia works with a number of talented flutists, cellists, brass players, vocalists, and string players. All of her collaborators are top-notch professional musicians in Washington, D.C., and can provide virtually any ensemble to fit your needs. To inquire about availability or for further information about booking harp music for your event, please contact Nadia directly.